Vaporizer2 was officially released on Feb 1st 2019! Please test the demo version on your system first! The standard version of Vaporizer2 requires a CPU with AVX vector extensions - if your system is older than from 2011 please check first! We added an SSE2 compatible version per huge demand. But take into account that this one will not achieve highest CPU performance. All downloads include both, demo version and full version. You unlock the full functionality by placing the license key file you have purchased in the Vaporizer2 folder. By downloading and installing you accept the license agreement. Version 1.1 (Feb 16th 2019) of the Vaporizer2 User's Manual is available and can be downloaded here. Find here preset banks that you can download and use with Vaporizer2. Usage rights are granted with the Vaporizer license. Just download and unzip to your preset / tables folder (e.g. a folder named 'presets' in the folder where your Vaporizer2 plugin is stored - or any other folder that you select in the plugin on the presets tab). The old Version 1.30 of VAPORIZER1 is still available. Look out for version 1.3 of the Vaporizer User's Guide that is released now. The plugin is available as 32bit / 64bit Mac OS X AU, VST & VST3. The demo version will mute audio out after ten minutes of testing and does not allow saving of patches / exporting to host. In case that you need a standalone executable version that runs without a VST host please follow the instructions here. By downloading and installing the demo you accept the license agreement. 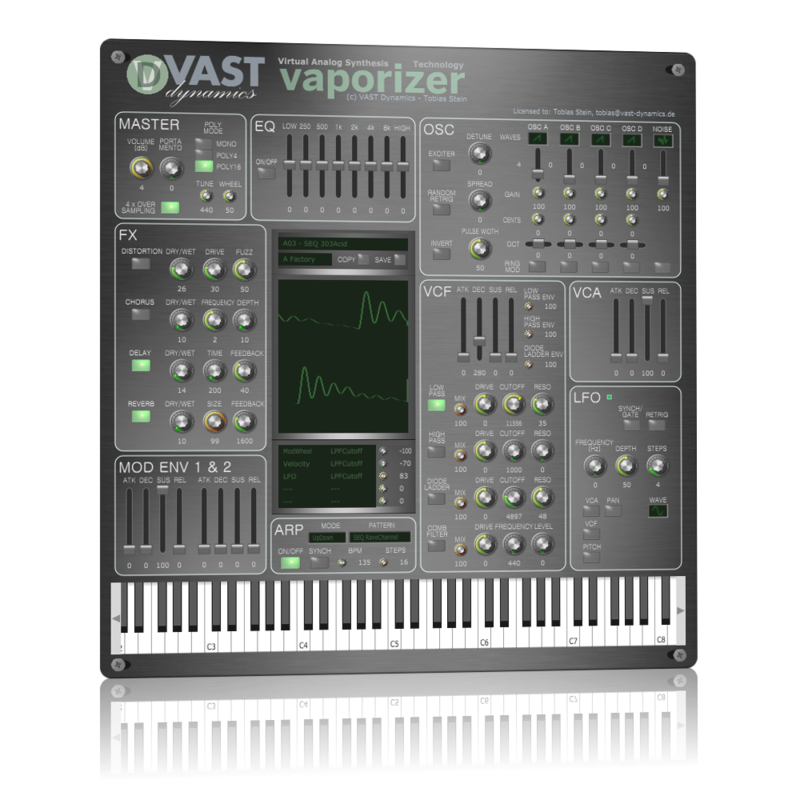 VAPORIZER is our first VST/AU synthesizer. The intention of this development is to combine a fat virtual analog sound with low system CPU resource usage. And all this with an unbeatably low price (factor 10 lower than usual synths in that category). Even though this synth basically follows a traditional subtractive analog synthesis model, we believe that is has it's own character and sound that needs to be explored. A main focus was laid on modelling fat supersaw-like sounds with various unison and detune models. VAPORIZER does not want to be smooth and gentle. It has sharp edges and can also be brutal. Check it out. With the release of Vaporizer 2 upcoming Vaporizer 1 is not sold anymore. You can use Vaporizer 1 with a Vaporizer 2 license. In case that you have a Vaporizer 1 license you can also use Vaporizer 2 with it. Just place the license file in the folder where your plugin is located. More than 110 presets with many different styles (more are continuously added in new versions). Dual LFO with cross modulation. Completely alias free oscillators (7 different waveforms). Up to 97 parallel oscillators per voice (4 unison / detune banks with max 24 plus 1 noise oscillator). 16 voice polyphony with a maximum number of 1552 oscillators per plug-in at a time.